It has been such a pleasure over the last few weeks with so many changes going on at the academy. We’ve not only changed owners, but we’ve also partnered with Sam Villa to further our students’ education and drive home the experience they have while they are on their journey here at JD Academy. We had the privilege of having the one and only Andrew Carruthers, education director of Sam Villa Hair, come to our East Bay campus and spend some one-on-one time with our educators and with our students. If you don’t know who Andrew Carruthers is, here’s a little background: Fueled by over 17 years of full-time work in a salon, his experience also includes salon ownership, photographic work, as well as personal and professional coaching. As an educator, Andrew has worked for many national cosmetology brands and is currently the Education Director for Sam Villa®, a brand specializing in a wide variety of online and live education. Those that experience his unique teaching style and insightful writing can attest to his authenticity and devotion to helping the everyday stylist behind the chair become better at what they do. If you’d like, you can read Andrew’s full bio here to read his full bio you can do so here. On our first day with Andrew, we went through some very important topics such a communication. For homework, we all took the Tony Robbins DICS personality test which helped us to better understand how we all tick when it comes to communication and processing communication when speaking to others. It was really cool seeing how some of us are quick to make decisions after given certain information or ideas while others needed to have downtime to process it. It also brought understanding, clarity, and openness between all of us. Next, we jumped right into hair education portion. This is what we were all super excited about since Andrew is the man when it comes to hair education. His teaching style was very humble and down to earth. — we felt as if he was a long time friend who cast no judgment when we asked questions. You could tell he has a true passion for what he teaches and loves what he does. We were all eager to consume what he brought for us education-wise. Sam Villa, along with Andrew and the rest of his team, are designing a curriculum for cosmetology schools. We were able to catch a glimpse of it during the training and while I can’t give away all the secrets, I’ll tell you that it’s very refreshing. They have managed taking something that can be so complex and made it what it should be — simple and easy to understand. 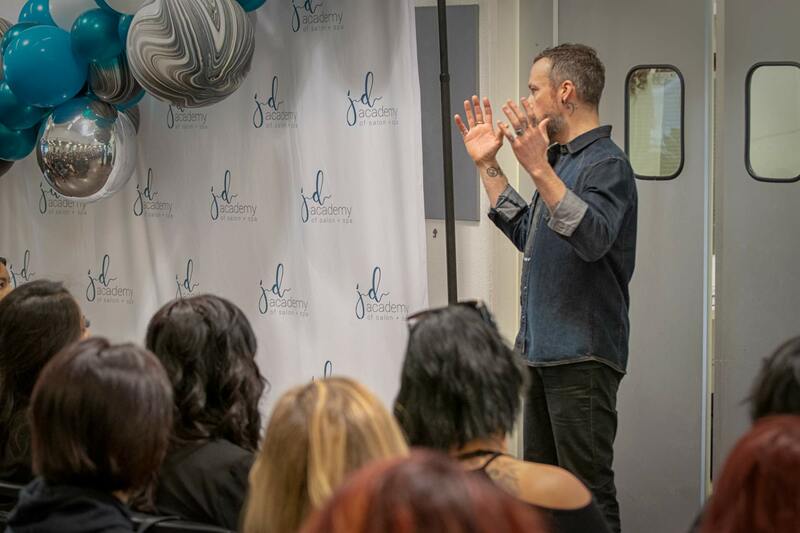 Everything is going back to the basics which is amazing for our students — not only will our students receive a great, high-quality education from JD Academy & Sam Villa’s approach to hair, but they will also be able to understand it. We look forward to what the future brings us here at JD Academy and we hope you do too. If you’re interested in a future in cosmetology then please connect with us.